iMeet Agenday is PGi's award-winning smartphone app that automatically combines all of your calendars so that you can easily navigate a consolidated view of all your personal and professional activities. The award-winning app displays a single, easy-to-read daily schedule and, with one touch, lets you join online meetings, dial into conferences, call a group of people, send "running late" messages, get turn-by-turn driving directions and more. iMeet Agenday also polls attendees to find the best time to meet and automatically updates Salesforce.com while on the go, letting sales professionals log sales calls and add contacts directly from the app. Since launching in March 2014, the app has benefited a variety of customers, expanded its features to encompass wearables and enterprise-wide deployment, and received substantial media coverage and awards highlighting its features. One iMeet Agenday customer, Moss Adams, uses the app to take control of their busy calendars and obliterate 100% of wasted pre-meeting prep time using the calendar app's time-saving productivity features. "I started using iMeet Agenday because I was unhappy with standard smartphone calendars. Now, I don't want to use anything else. I'm sold," said Patrick Beatty, Moss Adams IT specialist. “iMeet Agenday's consolidated calendar, simple interface and the ability to join a conference call with one touch, make my work-life significantly easier. Now, I don't have to stop working 10 minutes early to hunt down all the attendee info, passcodes and dial-in numbers.  Just one click, and I'm in." 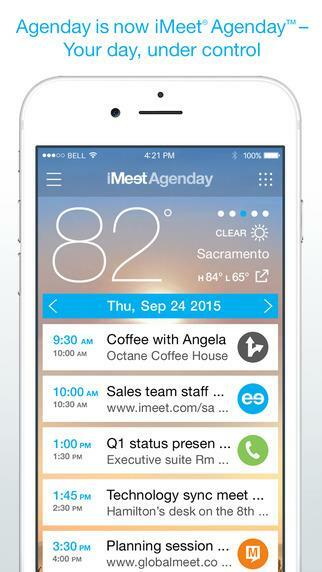 This year, iMeet Agenday has expanded to include additional features. The app now offers integration with wearables, announcing Android smartwatch apps in March and Apple Watch in July. 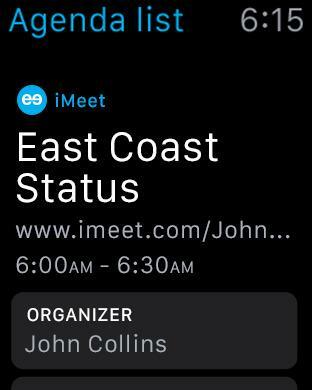 Unique and updated features for the iMeet Agenday smartwatch integrations include a meeting watch interface, “running late" notifications, join meetings with a click, a weather watchface and a free/busy polling feature. Each specific feature works together to elevate the product and overall user experience, beginning with the watchface itself, which allows users to schedule meetings with a quick click on their wrists. In June 2015, iMeet Agenday further expanded its offerings to include enterprise-wide deployment. These additional features allow companies to save money on mobile calls by automatically dialing into conference calls and online meetings using the most cost-effective number. Enterprises can also use iMeet Agenday banners to send company-wide announcements and broadcast vital company information. Finally, a web-based dashboard now helps enterprise administrators manage usage and employee data, as well as create custom banner and push-notification content. iMeet Agenday is a vital app for lifestyle and business as it allows users to be as efficient and productive as possible with their daily schedule. iMeet Agenday has over 35,000 active users on iOS and Android and there have been 85,783 conference calls dialed into via the app, from both platforms. Users have scheduled 34,974 events using iMeet Agenday since its launch. iMeet Agenday has received a significant amount of media coverage based on its services. The company has been recognized as a top consumer workplace tool by the NY Post, listed as one of the best free mobile apps by General Assembly and positively reviewed in Android Rundown. You can view video tutorials, feature lists and other iMeet Agenday product details at www.agenday.com.